Delta Dental of Oklahoma gives these tips for Easter treats this weekend! Cadbury eggs. Chocolate bunnies. 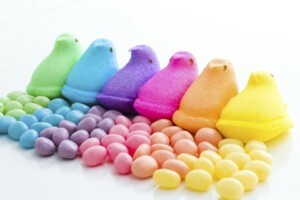 Marshmallow Peeps. It’s Easter Candy 101. Sure, the mingling of milk chocolate, marshmallows and fondant filling is downright delicious. But it’s also detrimental to your dental hygiene. This spring, replace the candy and chocolate with some healthy Easter treats. Use the alternative Easter basket ideas below and make your holiday a happy, healthy one. Hop to it! Not only will it freshen your breath after Easter brunch, it will help improve your oral health. It can help fend off cavities, strengthen enamel and even reduce tooth sensitivity. Plastic eggs stuffed with treats are an Easter-basket classic. This year, instead of Easter candy and chocolate, use nuts or dried fruits for some healthy Easter-egg fillers. When it comes to healthy Easter treats, carrots take the cake. Sure, it’s a little unorthodox, but it’s an Easter Bunny favorite. You can even toss in a small container of hummus to dip them in. Gift cards are one of many nonedible Easter basket ideas. From restaurants to Starbucks to iTunes gift cards, the options are endless. Sidewalk chalk is typically pastel-colored. Pastels are an Easter staple. Hmmm. A healthier Easter basket. Just a bunny hop, skip and a jump away.